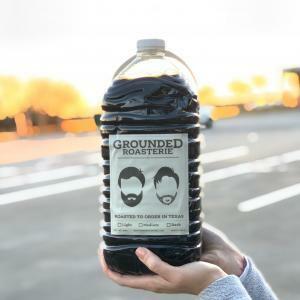 Grounded Roasterie – Life's too awesome to drink bad coffee. Life's too awesome to drink bad coffee. Small batch, roasted to order coffee and more. Pitalito hails from Colombia's southern Huila region and features a smooth, full body. This washed and patio-dried bean is known for its winey stone-fruit acidity and caramel finish. Pacamara hails from El Salvador's Alotepec-Metapán region. This honey processed bean has a bright, fruit acidity with honey and toffee notes, making for a complex flavor profile. This Certified FTO Yirgacheffe grows in the volcanic soil of Ethiopia's Gedeo Zone and features a smooth, medium body with delicious, sweet acidity. This bean features fruit-forward notes and with rich chocolate undertones. Atitlán is grown in Guatemala's Suchitepéquez region near the Atitlán Volcano and features a smooth, medium body and vibrant fruit acidity with notes of orange and chocolate. Montecillos is Strictly High Grown from Honduras' Montecillos region. This washed and patio-dried bean makes a bright, balanced cup with light hints of citrus and features a clean, smooth finish. Our Sulawesi Semi-Washed hails from Indonesia's Tana Toraja, Enrekang, and Mamasa regions and features a smooth, medium body with mild, sweet acidity. Balanced flavor, light dried fruit character, and cocoa undertones. Our Espresso Blend is a perfect marriage between our favorite Central American and Kenyan beans. This blend features a smooth, rich, and creamy body with fruit highlights — all layered above deep chocolate undertones. We use our Honduran Montecillos and 18 hours of patience to get the perfect extraction. Smooth and creamy with no bitterness or bite. Available in two convienent sizes. From small get-togethers in your home, to office parties, to weddings and other special events — Grounded Roasterie would love to be there with our mobile coffee bar and serve you and your guests delicious coffee. 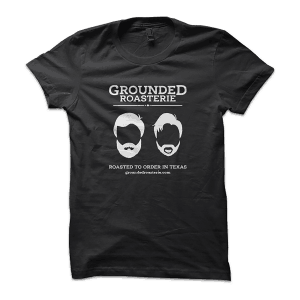 Show your Grounded Roasterie love in the most comfortable tee you’ll ever wear. 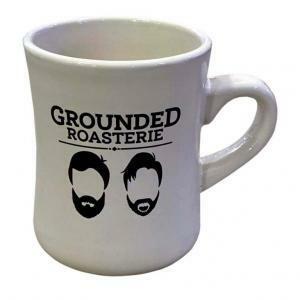 Enjoy your Grounded Roasterie coffee in style with our ceramic diner mug. From small get-togethers in your home, to office parties, to weddings and other special events — Grounded Roasterie would love to be there with our mobile coffee bar and serve you and your guests delicious coffee! One evening, Carl and Maury had the crazy idea to roast coffee beans with an air popcorn popper while their wives looked on, wondering what in the world they were doing. That fun evening ignited their desire to control as much of the coffee experience as possible, and they traded-in their faithful popcorn popper for a legitimate production roaster and began the journey to perfect the craft of small-batch, artisan coffee roasting. Grounded Roasterie sources a variety of origins and the finest beans from around the globe to bring you an eclectic and unique coffee experience. Our coffee is not roasted until it’s ordered to maximize freshness. We love roasting and drinking our coffee, and we’re confident you’ll love drinking it, too. And as if enjoying our delicious coffee wasn’t awesome enough, Grounded Roasterie also gives a portion of our sales to an amazing non-profit, Threaded Leaf Project.